While just about every new laptop and netbook come with a webcam and microphone built-in, these generally fail to offer acceptable quality. For webcams, some of you folks may choose to upgrade to a Logitech or Microsoft solution, a few of which we reviewed recently. But when it comes to audio, selecting a decent option is a bit more difficult. 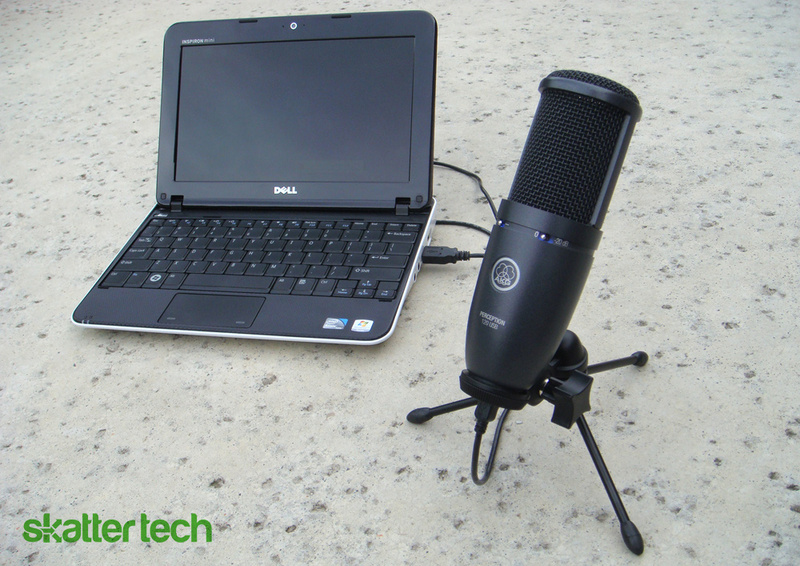 Using a professional condenser microphone with a laptop or desktop requires a powered stereo mixer plus with equipment to digitize audio or a XLR to USB converter. Fortunately, those looking to take their first step into professional audio no longer have to deal with multiple pieces of expensive equipment. AKG, a Harmon company, now offers an all-in-one solution that’s easy as plug-and-play. 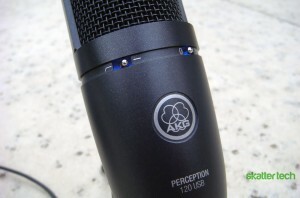 Getting started with AKG’s Perception 120 USB couldn’t be easier since it requires barely any experience with audio equipment and minimal computer skills for that matter. The packaging includes a few items in addition to the microphone: a mini desk tripod stand, a swivel mount, a lengthy USB cable, and an instruction manual. Competing solutions such as Shure’s PG-27USB, which we wrote about recently, fails to include a stand or mounting bracket. Assembling the microphon takes just less than a minute or two. While the tripod isn’t exactly the most robust of stands, it’s still a welcome inclusion. Fortunately, since the Perception 120 USB is compatible with any standard mount, finding alternate solutions isn’t an issue. As for software configuration, setup also took a mere minute or two. After plugging the included USB cable from the microphone into my Windows 7 laptop, my machine automatically detected and installed the necessary drivers. I didn’t need to install programs from a CD or download anything from the web. It was nearly instantaneous. Unfortunately, after launching applications like Audacity for a test recording or Skype for a video call, I found that my internal laptop microphones were still set as the default device. The issue was easily fixed once I set the AKG Perception device as the “default recording device” in the Sound section of the Windows Control Panel. Programs including Audacity and Skype also include the option to manually select a recording device as well, but tweaking the setting in the Control Panel makes the changes go into effect system-wide. I should note that the Perception 120 USB is entirely compatible with Windows XP, Windows Vista, and Mac OS X as well. I didn’t try it on all the mentioned operating systems, but it did work with my XP netbook and I probably wouldn’t be surprised to find it working with Ubuntu either. For those wondering, the technology inside the Perception 120 USB is actually fairly impressive. AKG has long offered a standard condenser Perception 120 microphone, but it differs from the USB model in a few ways. The original model, just like any condenser microphone on the market, is analog technology. It sports a 3-pin XLR connector and requires a powered mixer for use. Getting audio onto a computer requires an RCA to 3.5mm cable or a XLR-to-USB solution such as the one Shure offers. On the other hand, the Perception 120 USB model features an analog-to-digital converter inside. While the extra components do make the body somewhat heavier, it offers a few advantages for those trying to cut costs and simplify their setup. Without the need of any extra equipment, the Perception 120 USB connects directly to a computer’s USB port for power and transmits audio back simultaneously. And for those wondering, it’s quite similar to the concept behind the Blue Microphones Snowball, we reviewed last year. This is AKG’s first digital USB-enabled micophone, but it is already pretty impressive. When it comes to talking about audio quality, I should disclose something quite important: I’m not an expert. But here’s what I can tell you. As someone who creates video and audio recordings from time to time, I’ve used many microphones. Just for reference, this includes everything from the one that comes built-into a laptop’s bezel, a cheap 3.5 mm solution, a wired headset, a wireless Bluetooth one, and even ones inside external webcams. But more importantly, for a comparison, I’ve also heavily used the Snowball and PG-27USB. After extensive use, one thing is clear, this is one of the best microphones I’ve used. While this might be fairly entry-level for some professionals, this is probably better than anything you already own. Finding the appropriate levels for optimal quality isn’t difficult. There are only two switches on the front to enable a bass-cut filter and an attenuation pad. The bass-cut filter reduces disturbances from mechanical vibrations and wind noise while the attenuation pad drops gain for close-up use and instruments. In a fairly quiet room with minimal audible disturbances, I found the microphone sounding the best from about 2 feet away with both the extra settings disabled. I recorded bits of audio from the Snowball and this microphone to find the results astounding. While the Snowball was my favorite USB microphone of choice for sometime, it too picks up a hint of background noise and rumbling sounds from my computer. I also found the Snowball chopping off at highs quicker, turning them into faint hisses. On the other hand, the AKG Perception was immune to breathing sounds, static, pops, and vibrations. After playing back just a few seconds of recordings, the differences were clear: AKG’s microphone sounded significantly better. To further put my claims to the test, I had a few others blindly pick when I sounded best by switching between microphones during a Skype conference call. They all picked the AKG for the best sounding audio every time. Considering that it managed to isolate and eliminate just about any background noise aside from my voice, it’s pretty impressive. Although above the price range of a microphone that the average person would consider, this is great for those taking their first step into professional audio. However, there’s one thing this microphone lacks: a built-in monitor. Shure’s PG27-USB, while not too much more expensive, lets users directly plug a pair of earphones into the microphone. While it’s not something everyone needs, a zero-latency monitor is simply one of the easiest ways to fine tune a microphone to make sure that everything sounds right without having to check the output from another source. For those taking the leap into the realm of professional microphones, the AKG Perception 120 USB is a great place to start. It offers the convenience of a plug-and-play device that requires no additional equipment without sacrificing any quality. The packaging even includes all the essentials from a tripod to a USB cable to get started. But let’s make one thing clear: this isn’t for everyone. If you only intend to make a Skype once in a blue moon, you probably don’t need this. However if you place important VoIP business calls along with a HD camera, this is an excellent solution. Even if you are a professional, the Perception 120 USB is a great all-in-one travel solution. You won’t need to carry an extra XLR-to-USB converter, an amplifier, or a mixer with you. While there are numerous USB microphones on the market now, picking a brand-name item is quite important. AKG has a long-established reputation that’s synonymous with professional audio. While I don’t have the expertise to distinguish the quality differences between this microphone and the Shure PG-27USB, I can say that picking a brand name like AKG is a great decision. For those ready to make a purchase, the Perception 120 USB has a MSRP of $199, but it goes for as little as $135 through retailers such as Amazon if you shop around. 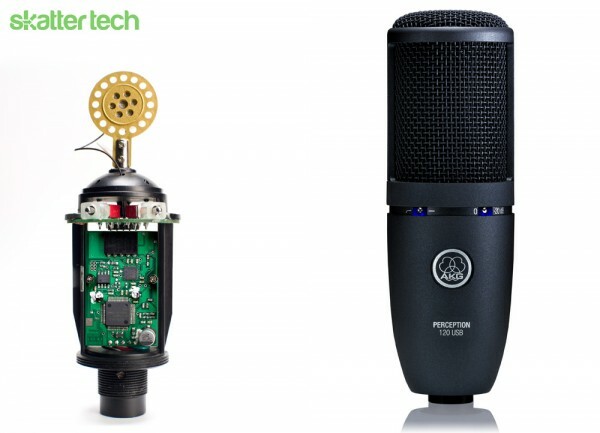 With a great all-in-one package, this microphone won’t disappoint.